"No! Someone help me! Please!" 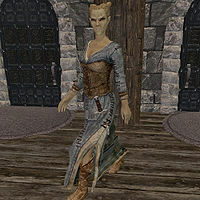 Arivanya is an Altmer bard who is married to Ulundil and lives with him at the Windhelm Stables. She takes over selling the stables' horses if anything happens to her husband, even though she constantly tells everyone how much she dislikes horses: "Horses. All day long. Do you have any idea how dull horses are?" She will then complain about her own smell, "Ugh. I'll need to bathe thoroughly to get this stench off of me." and talk about Ulundil, "I love my husband, but he can be a bit... dull at times." To get away from the stables and their stench she frequently heads to town, where she can be found in Candlehearth Hall or the New Gnisis Cornerclub. If you have not completed Blood on the Ice, she will comment about the Butcher: "If the guards would listen to Viola, they'd have caught the Butcher by now." She can be killed during the quest by Calixto Corrium, however it can be prevented by choosing to talk to Wuunferth the Unliving before Jorleif. If killed by Calixto, her body can be found outside Candlehearth Hall. Arivanya wears a set of farm clothes along with a pair of boots. She wields an iron dagger and carries a key to the stables along with a selection of common loot and gold. This page was last modified on 23 September 2018, at 16:38.